Well the launch of BSBA went extremely well and our wee stand was a hive of activity for the first couple of days especially, where all my appointment slots were taken. There was a great deal of positivity and support and I expect many more retailers and individual members to come on board judging by the membership forms taken. I was not sure how long a run through of what BSBA is all about would take and was amazed how much talking I ended up doing. Being a new association it was necessary to explain why we formed, the point of our existence and what we offer boot fitters and their employers. Nearly everyone who came on the stand were already sold on us being a great idea, those who were not so sure seemed to warm to BSBA once they knew more and realised we have good intentions with the ski trade as a whole at heart. We have two products really, one being the association which is a non profit making organisation which represents like minded boot fitters and their employers who want their trade’s profile raised, with accreditation and media support. The other being Skibootpro which is the association’s commercial training company, providing accredited training by some of the UK’s top boot fitters. The association is a non profit making organisation that only exists through our determination to support a trade we passionately believe in. We have received no financial support from the ski industry as yet even though we are trying to help it sell more ski boots correctly at the end of the day. We hope this will change in future but we are determined to keep evolving and strive to improve the ski boot fitting trade in the UK. Only by charitable time donated by myself and several others and Hamish Wolfenden’s financial input could we exist at all and I do believe we should pack ourselves on the back for making the effort to form BSBA in the first place. It should have excisted before and that is why we thought it had to be done now! The positive reaction from the people that came on the stand was much appreciated and we thank you all! Obviously we do have to recoup some of this financial and time investment but after that is done the membership revenue will be for improving the website, enabling running cost and promoting BSBA to the general public, so that members can start reaping the rewards of joining us. We do hope that people that did not come on the stand, (which was difficult as it was busy) realise that BSBA exists for the benefit of individuals, their employers, the general public and ski boot suppliers. We cannot see why people should not view what we are doing as a positive thing. So next up, our BSBA member boot test. This for the benefit of all BSBA members as it is focused towards what boot fitters would like to know when looking at a ski boot and indeed how it performs in a skiing situation. We will not publish the results to the public and we will strive, as ever, to be impartial and fair. Looking forward to it! Further to our telephone conversation earlier this week, I visited Lockwoods to purchase new ski boots. Firstly, the shop is extremely well stocked and the variety available was much larger than I imagined it would be. The staff were excellent; well informed, friendly and most professional. The person assigned to me was Tom. His manner was polite and courteous and he clearly demonstrated his vast product knowledge. He was most diligent and extremely patient during the whole fitting process. I would not hesitate to recommend Tom for fitting ski boots. Brilliant stuff and this is what we are all about! Moisture management, a ski sock is not designed to keep your feet warm, but a good sock can help this task by effectively managing the moisture (that’s right the SWEAT) which your feet produce, the only time there is not moisture being produced by your feet is well….erm…after you are dead, and your ski boots are not a lot of use then! So what can a sock do about this moisture? Selecting a fibre which can absorb but manage the moisture is key, rather than one which absorbs it and holds it next to the skin, moisture transmits heat and cold 23 times quicker than a dry surface…which means cold feet if they are wet. High grade merino wool or a manmade fibre for some people works best, the advantage of wool is that along with the fact that it is very good at absorbing moisture (it can absorb 1/3 of its weight in moisture without even feeling wet) it also has great antimicrobial properties…which means it doesn’t smell too bad, even after a couple of days of serious training! By absorbing and managing this moisture the wool sock helps to keep your feet warmer and dryer than they would in a manmade sock. 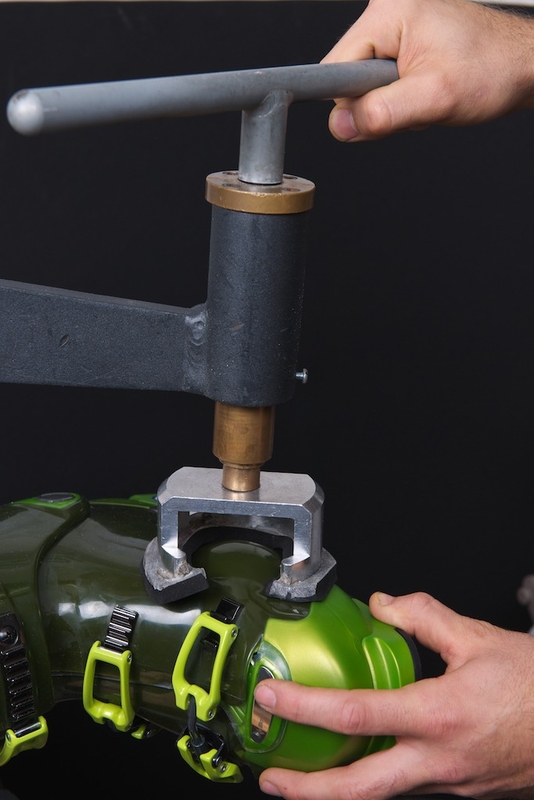 Fine tuning the fit of your boots….. The thickness of the sock can be critical even down to the difference between a pro weight and a light cushioned sock making a boot feel too tight or too loose. When we fit a pair of race boots the socks we would normally use would be either an ultra light weight or pro weight sock, this gives all the moisture management properties we want but takes up very little space inside the boot. A high quality sock doesn’t come cheap, expect to pay £18-£25 for a good pair depending on the brand watch out for technical features, padding in key areas like the shin, flex zones to prevent wrinkles at the ankle etc. but beware of gimmicks… you do not need left and right socks, the material in a sock is designed to stretch around the foot making them fit neatly onto either foot, besides if you put a hole in two right socks you have two useless left ones, if they are not left and right you still have two usable socks!! Select the size carefully too, if you are between sizes then if you have a slimmer foot try the smaller size , with a wide high volume foot then you may need the larger size, the sock should fit you snugly all over, whilst you do not want it to be cutting the blood off to your feet you most certainly don’t want baggy areas around the foot. So bin the ski tubes and the big think woolly socks that granny bought you last Christmas, treat yourself to some high quality technical ski socks, the kind of things which match the performance of the boots and skis which you take so much care to get right. Well it’s good to serve a purpose! Despite not having a listing of BSBA members on the site, we had two requests for member locations via the website. They both booked in with two members and have been very well looked after. So great stuff and this is only the start! We decided that a web presence was required as soon as possible so after a lot of chopping and changing I was happy to publish it. I have only really told facebook friends and snowheads so that I could gather feedback as we are not really launching until the SIGB’s snowsport trade show late feb 2011. We decided that http://www.skibootpro.co.uk would be the best website name as BSBA in its long form was too long and the short form was already taken. As the training side is run under skibootpro that seemed like a sensible website name. However it has gone down very well and on the snowheads forum comments like “great idea.nice website” , “Long overdue, well done on getting this of the ground”, “nice one guys” , helps us feel confident that there is support out there. Well we thought the best way to let prospective retailers know about us was to have a wee stand at Slide (21-23rd Feb in Telford) which is the Ski Industries of GB trade show, held every year. We are very excited about this as it is where we will officially launch our association and training brand Skibootpro. We are on stand B13 and hope to be busy bees!